SUPER HITS OF THE SEVENTIES! MIKE-SHELL PRESENTS - SUPER HITS OF THE SEVENTIES! Welcome to the headquarters for information about Michael Shelley's 2012 WFMU Fund Raising Marathon Premium CD "Super Hits Of the Seventies!" This fine collection has 22 guaranteed #1 hit songs - and each one has been lovingly, painstakingly, recorded EXCLUSIVELY FOR THIS COMPILATION! These recordings are available ONLY here! This genre defying collection is a must for all serious freeform music fans! 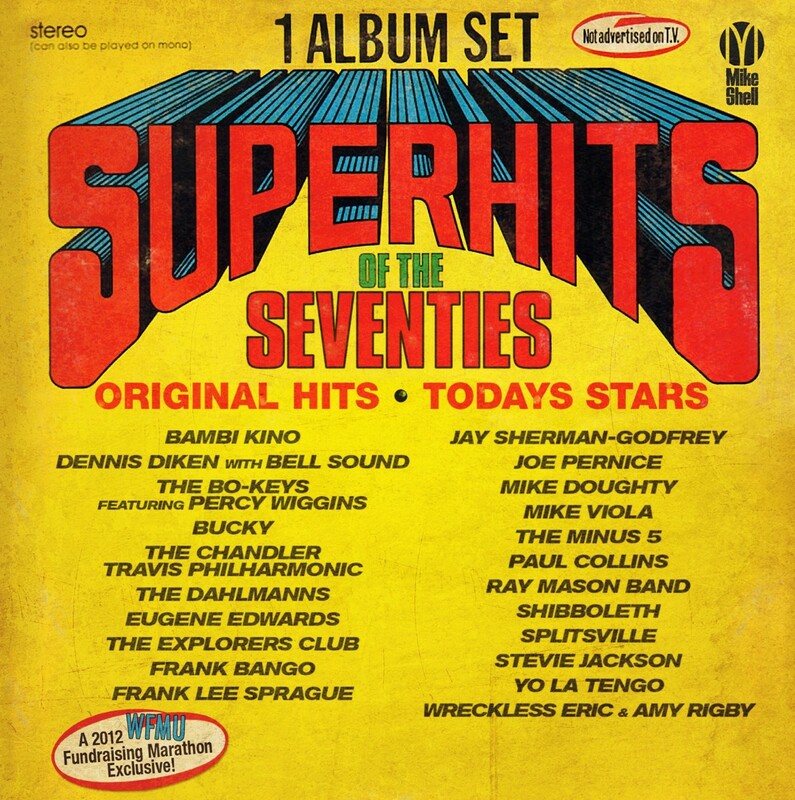 CLICK HERE for step by step details about how to get your copy of SUPER HITS OF THE 70's ! 1) Bambi Kino "You’re 16"
2) Frank Bango "You Wear It Well"
3) The Bo-Keys featuring Percy Wiggins "Stuck In The Middle With You"
4) Bucky "Band Of Gold"
7) The Dahlmanns "Ring Ring"
9) Mike Doughty "Take Me Home, Country Roads"
12) Stevie Jackson and The Wellgreen "Rock Your Baby"
13) Ray Mason Band “Come And Get Your Love"
14) The Minus 5 (Scott McCaughey & Peter Buck) "Arms of Mary"
16) Jay Sherman-Godfrey "Couldn't Get It Right"
20) Mike Viola "Lonely Boy"
21) Wreckless Eric & Amy Rigby "The Guitar Man"
22) Yo La Tengo "I Saw The Light"
CLICK HERE to download the 15 page LINER NOTES to "Super Hits of the Seventies!" CLICK HERE to hear clips from side 1 of SUPER HITS OF THE 70's ! 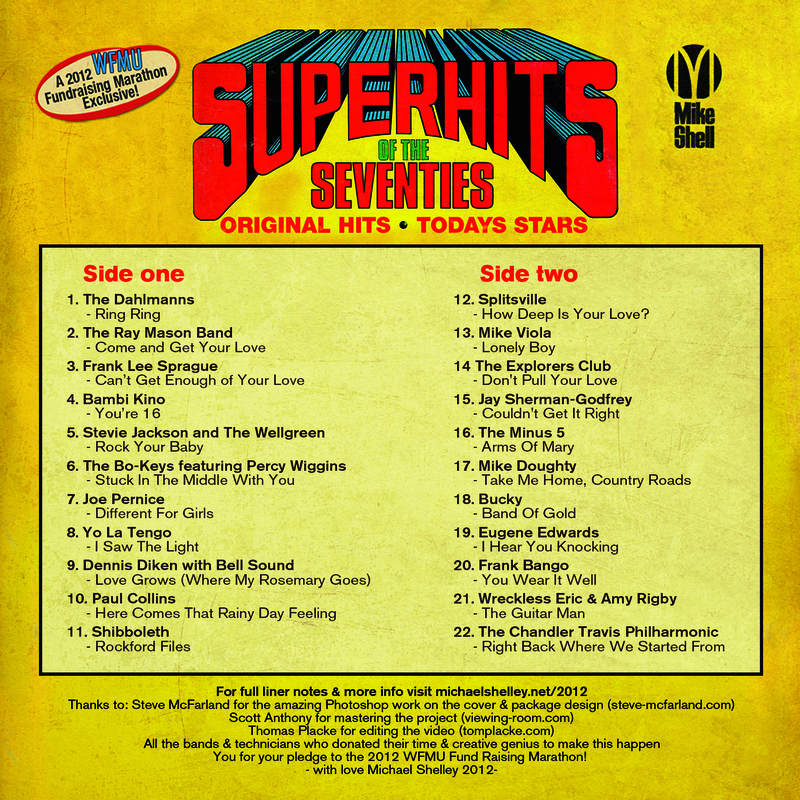 CLICK HERE to hear MORE clips from side 2 of SUPER HITS OF THE 70's ! CLICK HERE to read The New Yorker magazine article on Super Hits of the Seventies! CLICK HERE to read The New York Daily News article on Super Hits of the Seventies! -Thomas Placke for editing the video! -Scott Anthony for mastering the project! -Rex lending his voice talents to the commercials! -You for your pledge to the 2012 WFMU Fund Raising Marathon!